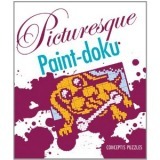 Pixel Paint by Number Logic Puzzles Books - also known as nonograms, griddlers, japanese puzzles and art by number puzzles. Pixel Paint by Number Logic Puzzles are also known as nonograms, griddlers, hanjie japanese puzzles and art by number puzzles. 31 mini puzzles to take along wherever you go! Take this book along with you to the beach, or on your summer travels! Due to its small size, it fits easily in your bag or tote! This book would also make a great holiday stocking stuffer! This is the second in my line of mini puzzle books. This book measures just under 6" x 4-1/2" and features 31 puzzles to solve (30 puzzles inside the book and the small bonus puzzle on the cover!). These puzzles are small and easy puzzles. The book includes answers for all of the puzzles, however there is no "how-to-solve" section. If you need instructions, Click Here. 30 mini puzzles to take along wherever you go! Take this book along with you to the beach, or on your summer travels! Due to its small size, it fits easily in your bag or tote! This book would also make a great stocking stuffer! This is the first in my line of mini books. This book measures just under 6" x 4-1/2" and features 30 puzzles to solve. These puzzles are small and easy puzzles. The book includes answers for all of the puzzles, however there is no "how-to-solve" section. 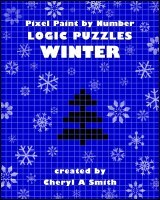 Celebrate Winter with the fourth in my series of pixel paint by number logic puzzle books. Featuring 100 original and challenging puzzles; this edition includes many Winter themed puzzles covering topics such as Winter holidays, sports, and activities. 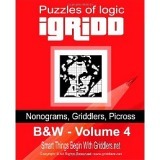 As with my previous books, the puzzles found in this collection cover a range of difficulty and sizes, offering a nice selection whether you are looking for a quick puzzle or something more challenging. 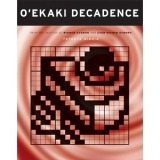 Spring is in the air with the third in my series of pixel paint by number logic puzzle books. 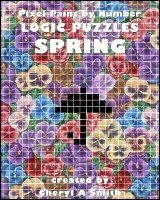 Featuring 100 original and challenging puzzles with a Springtime theme; this edition includes puzzles covering Springtime sights, holidays, sports, and a few surprises. 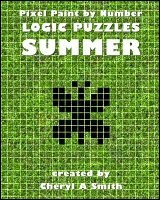 The second in my series of pixel paint by number logic puzzle books, this edition features 100 original and challenging puzzles with a Summer theme. You will find many of the sights of summertime in this collection, including all types of recreation and relaxation. As with my first book, the puzzles found in this collection cover a range of difficulty and sizes, offering a nice selection whether you are looking for a quick puzzle or something more challenging. 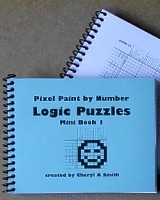 The first of several planned pixel paint by number logic puzzle books, this edition features 100 original, challenging puzzles sure to exercise your brain with logic and reasoning. Themed for Autumn, you will find many puzzles featuring back-to-school items, creeps and critters for Halloween, Autumn foliage, and a Thanksgiving feast! 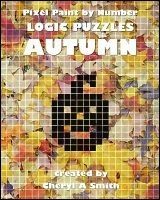 Puzzles found in this collection cover the complete range of difficulty, offering a nice selection whether you are a beginner, or have been solving for years. Each puzzle has been verified as solvable, and double checked for accuracy. These puzzles have not been previously sold to magazines or other collections, so you don't have to worry about solving the same old puzzles you have solved before. These books are OUT OF PRINT at this time. 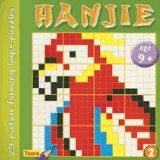 Art Puzzles by Number, Griddlers, Nonograms, CrossPix, and Hanjie Puzzles. Are you are looking for Paint by Number Kits?